A model of the black hole system with the jets that have been found to contain atomic matter. Credit: J. Miller-Jones (ICRAR) using software created by R. Hynes. Using data from the XMM-Newton satellite and CSIRO’s Australia Telescope Compact Array, astronomers reveal the contents of mysterious black hole jets. An international team of astronomers has answered a long standing question about the enigmatic jets emitted by black holes, in research published today in prestigious journal Nature. Jets are narrow beams of matter spat out at high speed from near a central object, like a black hole. “Although they have been observed for decades, we’re still not sure what they are made of, or what powers them,” ESO astronomer Dr María Díaz Trigo, lead author of the study, said. The team studied the radio waves and X-rays emitted by a small black hole a few times the mass of the Sun. The black hole in question was known to be active, but the team’s radio observations did not show any jets, and the X-ray spectrum didn’t reveal anything unusual. However, a few weeks later, the team took another look and this time saw radio emissions corresponding to the sudden appearance of these jets, and even more interestingly, lines had appeared in the X-ray spectrum – the tell-tale signature of ordinary atoms – around the black hole. “Intriguingly, we found the lines were not where they should be, but rather were shifted significantly,” Dr James Miller Jones from the Curtin University node of the International Center for Radio Astronomy Research (ICRAR), who led the radio observations, said. The same effect occurs when a siren from a vehicle changes pitch as it moves towards or away from us, as the sound wave is shortened or lengthened by the movement. “It led us to conclude the particles were being accelerated to fast speeds in the jets, one directed towards Earth, and the other one in the opposite direction,” team member Dr Simone Migliari from the University of Barcelona said. 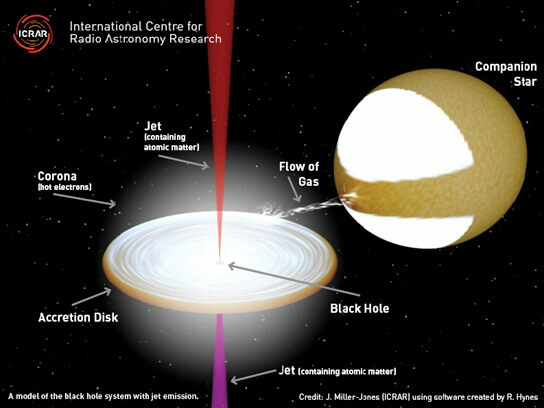 Dr Miller-Jones said this is the first strong evidence of such particles in jets from a typical small black hole. “We’ve known for a long time that jets contain electrons, but haven’t got an overall negative charge, so there must be something positively charged in them too,” Dr Miller Jones said. Positively charged atoms are much heavier than the positrons astronomers thought might make up the jets, and therefore the jets can carry away far more energy from the black hole than previously confirmed.What’s more, astronomers aren’t sure whether the jets are powered by the spin of the rotating black hole itself, or whether they are instead launched directly from the disk of matter that surrounds the black hole. “Our results suggest it’s more likely the disk is responsible for channeling the matter into the jets, and we are planning further observations to try and confirm this,” Dr Miller-Jones said. Using the X-ray data, the team also determined the jets were moving at 66% of the speed of light, or 198,000 km/s, the most accurate determination to date of the jet speed from a run-of-the-mill black hole that’s a few times the mass of the Sun. For their observations, the team used the European Space Agency’s XMM-Newton satellite to observe X-ray emission from the black hole, as well as CSIRO’s Australia Telescope Compact Array for the radio observations. 2 Comments on "Contents of Mysterious Black Hole Jets Revealed"
So … nothing can escape a black hole … except all this really speedy matter, that somehow seems impervious to all the gravity ? How does that work, exactly ? Same way an asteroid might be expelled from the gravitational force of the sun. Black holes aren’t quite like the vacuum cleaners they are made out to be. They are REALLY dense points of matter(ish) with a particular mass. If I were to compress our sun into a black hole, because you know… I’m a supervillian, and not alter the MASS (matter content) of the sun in any way the Earth would continue orbiting exactly as was. Accept a lot more dead people. That would change. That said, if you take a black hole and throw it into a cloud of dust and gas (nebula) or, say a planetary system like ours it would eat up some of the matter that did not have a stable orbit, but some of the matter would fall into a disk around the black hole (Sorta like Saturns rings, only a lot crazier and less stable) Much of that matter would be in a decaying orbit. Spiraling inward speeding up and increasing in pressure as it goes (like a giant funnel pushing matter down the plug hole). But sometimes if the BH bites off more than it can chew the plug hole gets stopped up, and matter is expelled at the poles of the BH. There’s a lot we don’t know about black holes, and much of ^ is subject to change with new observations- but this is a pretty decent and reliable elementary framework.